Any time there is a customer service miscommunication, it’s frustrating for you and your client. And when these miscommunications mean a canceled appointment—it’s expensive! Let’s say you run a home service business like an appliance repair company. You’ve talked to a brand new client and they’ve booked your services to repair their laundry machine. You’ve spent time providing your client with a quote, you’ve scheduled the service call, and you’re ready to get to work. On the day of the appointment, you arrive at your client’s home, knock on the door, and… the homeowner isn’t there. This happens to many home service companies, no matter what the industry. You have a client who wants your services, is ready to pay, but somewhere along the line they made a mistake and forgot when the appointment was scheduled. This is frustrating because it was your client that forgot about the appointment. You felt like you did everything in your control to be prepared and make sure the service call went smooth. But this scenario isn’t about casting blame—instead you should be thinking about proactive ways to improve your customer communication so your professionalism stands out and you avoid last minute cancellations. Sending your clients a reminder before their upcoming appointment is a great way to boost your professionalism, increase communication with your clients, and be proactive in preventing last-minute cancellations. Jobber users in the United States and Canada can send manual or automatic text and email reminders right from Jobber. To set up automatic reminders, go to the settings page of your Jobber account and click Client Reminders. You can choose to automate email reminders, text reminders, or both. You can learn more about how to set up your reminders or even customize the message by checking out our help documentation. In our business when we dispatch a crew out to a job we have a lockout fee. But just to have a reminder go out a day before or a couple days before has really decreased the number of times we have had people say ‘Oh we forgot you were coming.’ It’s great because you really don’t want to enforce that lockout fee. So we know that appointment reminders can help reduce last minute cancellations, but it doesn’t end there. Appointment reminders can help your professionalism stand out and improve the relationship you have with your customers. Is there anything your client needs to do to make sure they are prepared for your service appointment? This is your opportunity to remind your client so there are no delays when you arrive. Do clients ever have special requests or new instructions? Remind them to let you know ahead of the appointment so you can be fully prepared. Your appointment reminder templates are an extension of your commitment to top notch customer service. 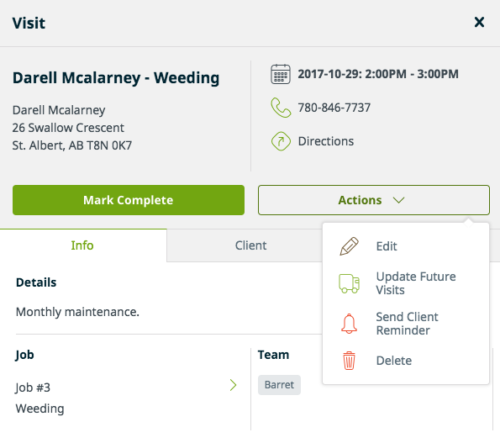 Use this feature in Jobber to automate this task—your customers will appreciate it and your professionalism will stand out from the competition.